This is the year of the kumquat for me. I haven’t posted the sweet preserved kumquats with spices yet and I finally figured out how to poach kumquats to make candied kumquats that hold their shape (the answer is slowly and not for too long). However, kumquats have been a regular feature around here for months, served in salads, a garnish for vegetables and as a condiment with shrimp. After what I thought was a very successful Mango and Kumquat Jam a month or so ago, I tried my hand at Strawberry-Kumquat Jam and Rhubarb-Kumquat Jam. With gorgeous but skinny rhubarb stalks from the farmers; market, I set out to make the Orange Rhubarb Jam with Ginger that I made last year. However, there were no oranges in the house, only a lot of kumquats. Kumquats are not citrus fruit contrary to popular opinion, but they have similar characteristics. Both of these recipes came from the excellent Blue Chair Jam Cookbook by Rachel Saunders, a hefty and yet charming book published last year. The rhubarb, cut into matchsticks about 1 ½ inches long, required a 24-hour maceration period to get the sugar somewhat dissolved and the juices flowing. With the addition of thinly sliced kumquats (the most time-consuming part of which was digging out the seeds) and some lemon juice (which helps the gel), the jam was ready in no time. I omitted Saunders’ orange flower water, and get the cooking time down. Of course I also halved the recipe and reduced the sugar. The strawberry jam had double the amount of kumquats and needed no extra maceration time. Apart from the preparation of the kumquats, this also provided quick gratification. The result was a wonderful combination of the sweet, smooth strawberry base and the piquant bites of kumquat. 1 ¼ lb rhubarb, cleaned, trimmed and cut into 1 ½-inch long matchsticks. Macerate the rhubarb in the sugar for 24 hours, stirring occasionally to dissolve the sugar. Prepare the jars and water bath canner (if you’re canning this). Place a saucer in the freezer for testing the getl. 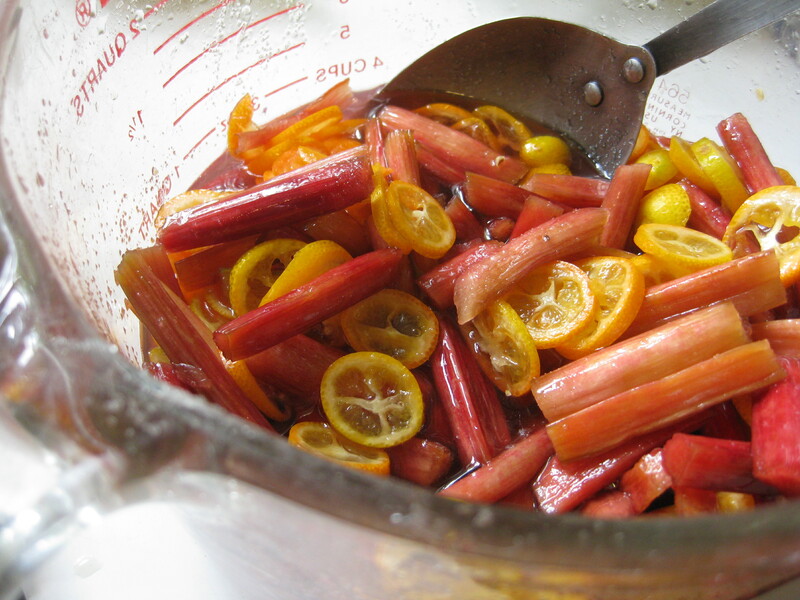 Place the macerated rhubarb, kumquat and lemon juice in a large wide pan and slowly bring the mixture to a boil. Boil vigorously for about 10 minutes, stirring occasionally in the beginning and constantly at the end to avoid sticking. Test the gel and when done, ladle the jams into the warm prepared jars. Process in a water bath canner for 10 minutes after the water comes to a boil. Remove the lid, turn off the heat and let sit for five minutes. Remove the jars to a counter to sit undisturbed until cool. Makes three 8-ounce jars or six 4-oz jars. Place all of the ingredients into a large wide pan and slowly bring the mixture to a boil. Boil vigorously for about 10-15 minutes, stirring occasionally in the beginning and constantly at the end to avoid sticking. 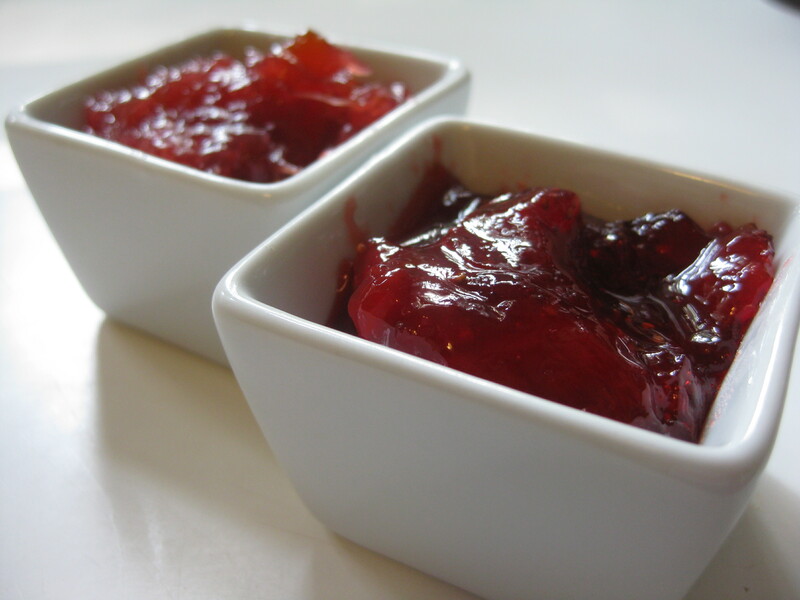 Test the gel and when done, ladle the jam into the warm prepared jars. 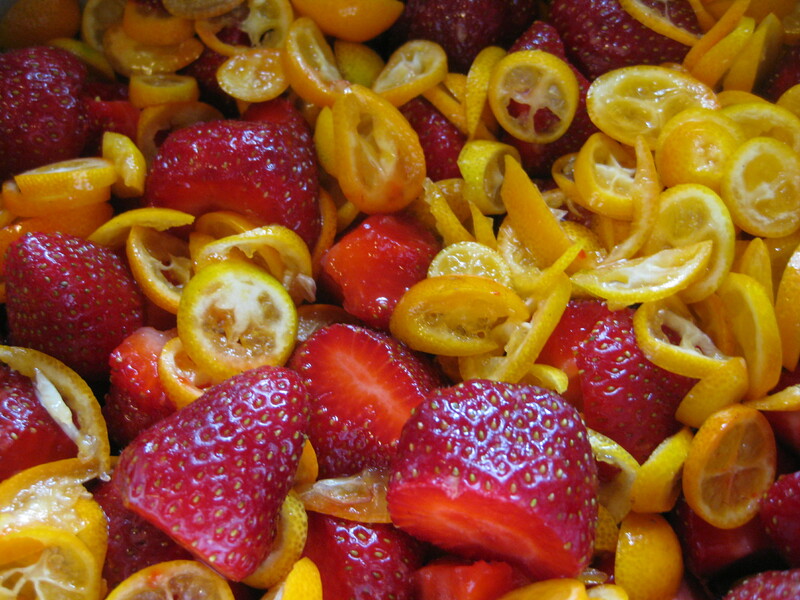 I’ve made the Strawberry Kumquat twice and its really wonderful and easy! !